This summer SECOORA partners hosted Pedro Matos-Llavona from the University of Puerto Rico at Mayagüez for a summer internship as part of the NOAA Educational Partnership Program (EPP) and the Integrated Ocean Observing System (U.S. IOOS). The collaborative effort between SECOORA partners Dave Easter (U.S. IOOS), Felix Jose (Florida Gulf Coast University- FGCU) and Jay Law (University of South Florida College of Marine Science- USF CMS) provided Pedro the chance to practice as an oceanographer, gaining hands-on experience and knowledge in the field. "I believe this internship opportunity helped Pedro to learn advanced methods in oceanographic data analysis, which would help him to pursue a career in coastal ocean monitoring”- Felix Jose, FGCU. During his internship Pedro spent half his time analyzing data under the mentorship of Felix Jose at Florida Gulf Coast University (FGCU). Pedro learned about time series data analysis. Using Harmonic Analysis, Pedro analyzed ADCP data from a USF COMPS Buoy off Fort Myers Beach for the duration June-July 2013. He filtered the data for tidal and non-tidal components and compared it with wind data collected from the same station. Pedro was trained in using matlab software for processing and plotting oceanographic data. The matlab program that he developed during his time at FGCU could help him to expand his research horizon; especially in the field of coastal circulation and monitoring. For Pedro’s second part of the internship, he planned a research cruise on the R/V Bellows. He assisted in the process of recovering and analyzing ocean data under the mentorship of Jay Law, USF real-time Coastal Ocean Monitoring and Prediction (USF COMPS) System Research Associate. 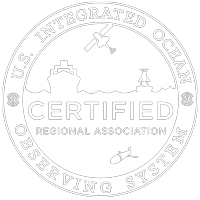 USF COMPS was established by The Ocean Circulation Group (OCG) to provide real time information for the West Florida Shelf. USF OCG, headed by Professor Robert Weisberg, engages in physical oceanographic studies of the ocean circulation and the interactions between the oceans and atmosphere. The goal of the cruise was to (1) release and recover a 2,400lb bottom mount equipped with an Acoustic Doppler Current profiler; and (2) replace sensors on one USF COMPS buoy. Pedro acted as Chief Scientist on the cruise, directing control operations during the retrieval/release of bottom mounts and replacing sensors on a buoy. Pedro had the opportunity to gain scientific training dives by servicing the bottom mounts. Watch the video to hear Pedro talk about his internship!